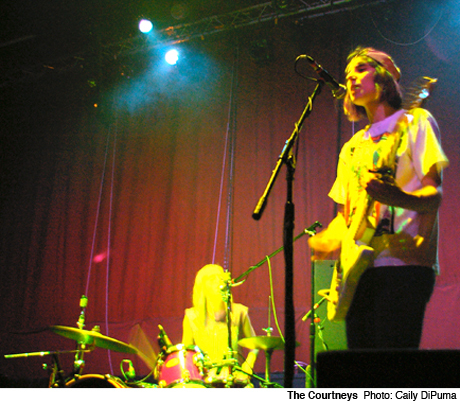 The Courtneys are something of an enigma. To date, very little has been written about the Vancouver power trio except that they are probably not from Courtenay, BC, and not all named Courtney, a notion reinforced when they noted their usual bassist was on tour and replaced by a muscly, shirtless dude named Johnny. Roughly picking at the style of riot grrrl indie rock best represented by Sleater-Kinney, they weren't the most skilled band. Yet, for the most part, their reckless abandon captured the spirit of what they were going for, with trashy guitars and propulsive drums set against angst-ridden lyrics about mandatory suicide and working for yourself sung more enthusiastically than tunefully by drummer Jen Twynn Payne. Their ragged sound was capably propelled by their unrefined urgency, while their banter showed a shameless playfulness, as the rest of the band tried to goad Payne into telling stories and razzed her about her 17th birthday the next day (a particular birthday she has celebrated many times now). Payne would later admit to forgetting some of her lyrics, but we got the point. They're fun.